This is a project that has been in the making for many years, involving several sets of hands. Long before I was even really trying out quilting, my grandmother was embroidering quilt blocks to give me. She bought (or was given) kits of pre-printed blocks in kind of kitschy, antiquated patterns, but it was something to keep her busy in the years after my grandfather passed away, and she seemed to have enjoyed the creative work. While she was still alive, she gave me a set of twelve embroidered blocks in a colonial ladies pattern. At the time I didn’t really know what, if anything, I could do with them, but I kept them tucked away among my stash of knitting, sewing and craft supplies, in the hopes that some day I’d come up with an idea. You see, back in 2013, she took a fall and ended up in hospital with a fractured shoulder, and ultimately, she wouldn’t end up going back home. She needed to be moved into long-term care. My mom, aunt and cousins took on the monumental task of clearing out her home of approximately 20 years. The purge yielded yet more packages of embroidered quilt blocks, many of them labelled with the names of us cousins. I came home with two more sets of blocks. By now I had a fair bit of experience machine quilting, but was still perplexed with to do with pre-embroidered quilt blocks. I didn’t think machine quilting would be appropriate for these blocks. I imagined it would damage or cover the embroidery, not to mention, how would I figure out a colour scheme to go with all those random colours of embroidery? And finally, I had only ever quilted lap size quilts, and at least one of these would be quite a bit larger. How would I machine quilt such a large project? Fast forward to late winter 2015, while I was biding my time waiting for a baby to arrive, and had worked down my entire to-do list. I was looking for something to keep me busy during the waiting game. 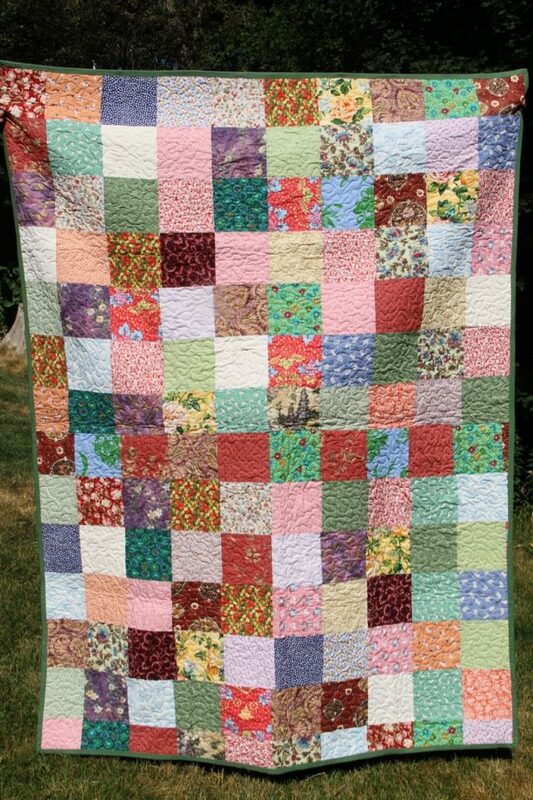 I recalled a Craftsy workshop I had purchased a few years earlier but never completed (called Quilting Big Projects on a Small Machine), about creating quilts in smaller sections that could be assembled into one larger quilt. I did a little more research into quilting around embroidery, and into what kind of stitch spread my batting required to maintain its integrity. And from there, I got started. Crazy patchwork backing to go with the colonial ladies embroidery. 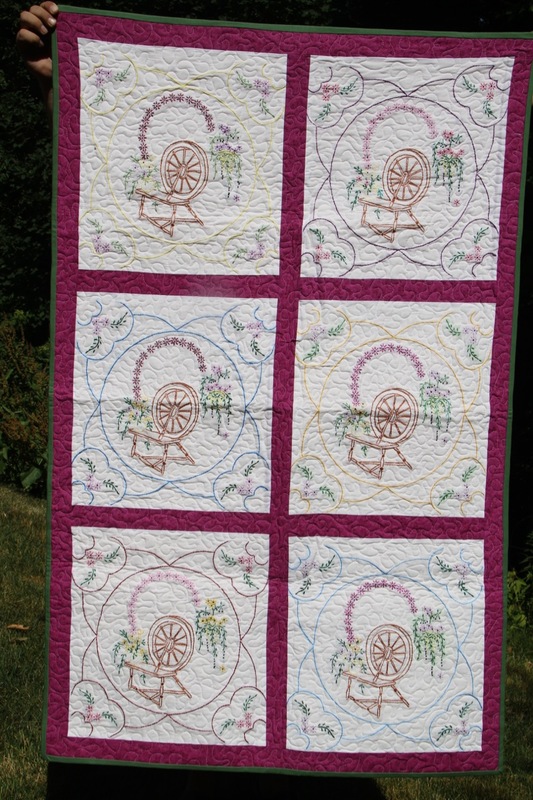 I used a series of civil war reproduction fabrics I had obtained through a monthly fat quarter subscription I started several years earlier when I was just getting started with my quilting journey. These fabrics came in the mail and I kind of hated most of them, as I didn’t really know what the heck I’d do with them. But as it turned out, they were entirely appropriate for this project as they suited the colonial ladies design perfectly (disclaimer: “colonial ladies” describes a traditional, historical design in colonial American quilt making. I want to be clear I do not idealize the dark period of history this print represents and I didn’t choose this design, it was gifted to me). Each embroidered block was about 17 to 18 inches square, and I only had twelve. I needed to add a border to each block to extend the size of the quilt (it’s turned out to be a little too small for a double bed, but still a nice size for a single person to snuggle under). For the backing, I stuck with a theme of using up mismatched fabrics I’d gotten through the subscription and created a patchwork backing that plays off the front, and extends the colour scheme. For a while I thought it was looking really friggin’ crazy, but surprise surprise, it seems to really work! This project stalled for about a year, because a certain baby decided he was ready to join the world. I had gotten the top pieced (in two halves) and part of the backing pieced. I was able to pick it up again in the weeks after my son started daycare and before I started work again. Another set of blocks by my grandma. However, before I got to the quilting stage of this, the largest quilt, it occurred to me that I had two cousins getting married over the summer (with whom we shared the same grandmother), and I had two more sets of grandma’s quilt blocks. I realized that these could become very sentimental wedding gifts. The last set of quilt blocks embroidered by grandma. The first attempt at quilting was the rings pattern. I tried to follow the block’s suggested quilt lines. My stitch lines are wonky and awkward, with a million stops and starts, which aren’t conducive to clean, even lines of stitching. But I got it done. I realized after inspecting it fully that because the machine quilting stitches are so small, it didn’t really matter that much if it ran over the embroidery now and then. So on the second lap quilt, I stuck within my comfortable meandering machine quilt pattern, and simply aimed to stay off the embroidery lines when possible, but didn’t worry too much if it went over, and sewed over embroidery when it meant moving into a new open zone for quilting. The results are significantly improved. By the time I moved on to stitching my much larger, colonial ladies quilt, I was well practiced at working around the embroidery. The technique for stitching a large quilt in smaller parts requires sandwiching layers together along the seams after quilting, and it worked really well. The untrained eye would never realize it was assembled after quilting. And that’s that. I’ve heard from one of my cousins what an amazing and moving surprise it was to receive her quilt, which made me feel really great. They aren’t the most perfect specimens of craft work, but they will have long-lasting meaning and sentiment, and reflect the love of those both present and gone from our lives. It made me feel connected to my grandma again, who, despite her faults, I really miss at times of year like this. I hope she’d be proud of this work. Previous Post Branding or Botany?